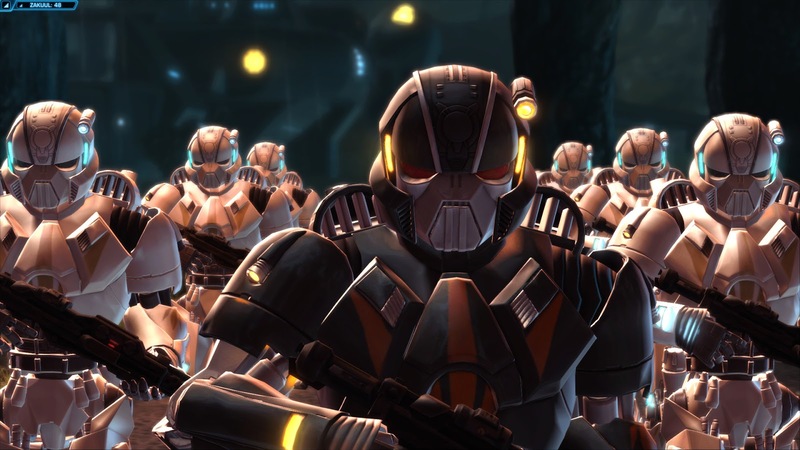 Knights of the Fallen Empire (KotFE) was developer Bioware’s first episodic outing. The initial nine episodes, or chapters, launched together late last year, and the following seven released monthly, starting in January this year. The Old Republic is a Massively Multiplayer Online (MMO) role-playing game, one with the most story; utilising Bioware’s dialogue wheel and narrative sensibilities. Over the years, Bioware struggled – and continues to – to meet the wants of its player base; those who come for the MMO gameplay, and those for the story – they are not always one and the same. Since launch nearly five years ago, the content added through expansions and updates featured stories, and their quality remained relatively consistent, but none could even approach the majesty of the eight distinct storylines that the base game launched with. KotFE is a story expansion through and through however, it has plenty of combat, that’s for sure, but it is heavily orchestrated and significantly easier. Most combat encounters feel designed to support the storytelling, but there are plenty of instances where one mob too many may catch your character’s scent. 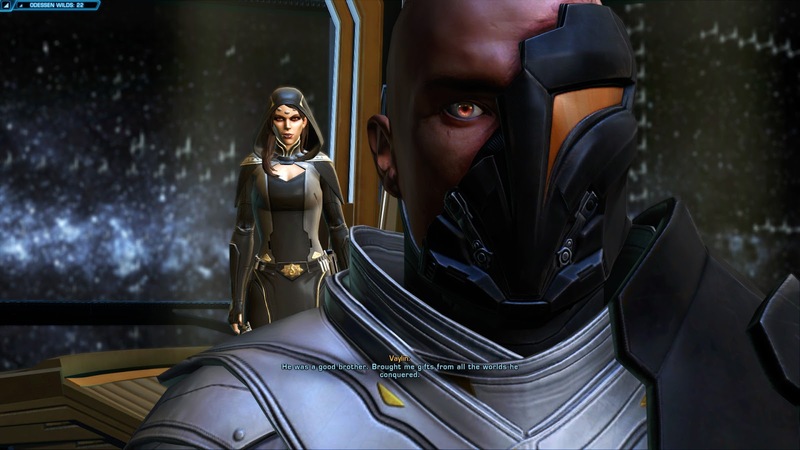 Episode one kicked off some time after the events on Ziost, a free two-part event that followed up on the previous expansion, Shadow of Revan. These early episodes are replete with fresh art and bursting with cutscenes, featuring new animation – on face, this may sound a little ridiculous, but SWToR as with many an MMO, is rife with reuse. Upon completing the first release I rejoiced; finally, a Bioware Star Wars story that managed to slip the MMO structural collar! 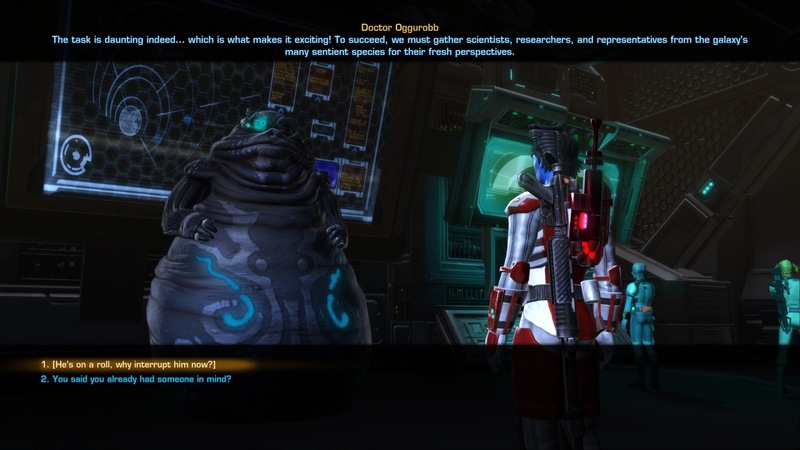 Though to be clear, I don’t hate SWToR’s structure or mechanics, but I do play for the narrative. Those first nine episodes recaptured, largely through improved cinematography in and out of cutscenes, the essence of the Star Wars story. Not the side story, excellent though they can be, but the battle between good and evil. They demonstrated an understanding of what the spirit of Star Wars is, more successfully than the prequel trilogy ever did. It’s very much the Bioware take on that story however, with a degree of player choice, and a few genuinely moving character arcs. To set the scene; a previously unknown power stirs, and at long last steps forward to wage war on the depleted Galactic Republic, and the faltering Sith Empire. The galaxy falls quickly to the Eternal Empire of Zakuul, but you’re not around to see it; events transpire and your character is incapacitated. The Outlander, which is what you become known as, regardless of faction or class, rises years later to free the galaxy from the iron fist of Zakuul, for better or worse. KotFE does an admirable job of recognising your character; their abilities and achievements, despite needing to funnel all eight classes into one narrative. But it was learning about Zakuul, its people and their customs, the war it waged in your absence, and later, the Eternal Fleet, that I found most satisfying. They are an enemy quite unlike the Empire or the Republic, though they are human. And that’s important, because it offers an entirely new and alien setting to explore, but also allows for distinctly human stories, providing an understandable grounding. The Empire of Zakuul relies upon armies of Skytroopers; droids who die in numbers that far eclipse that of the Stormtroopers they are designed to evoke. But there organic soldiers too, including two castes of Force users; the Knights, warriors who follow neither Light nor Dark, and the Scions, prophets first and foremost. And for readers of the Legacy comics; know that the Knights of Zakuul are not half as formidable as the Imperial Knights, though the Scions all wield pink lightsabers. 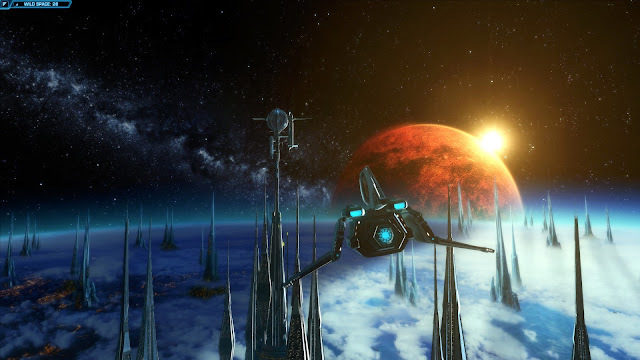 However, Zakuul’s real power lies in the void, for they possess the Eternal Fleet, a seemingly numberless host of powerful warships. The first nine chapters tell a story focused on the Outlander, against the new and frankly exotic backdrop that is Zakuul. It feels like a fresh beginning, something true new in the Star Wars universe, spun from Bioware’s narrative yearn. Yes, it is good versus evil, and you’re the underdog, but damn if it didn’t keep me asking questions the whole time. The mystery encroaches, the drama heights, and the excellent nine chapter arc culminates in an expertly honed mid-season finale. The only blemish to this point, so far as I could see, was the seemingly slight impact story choices had. The Alliance system is introduced after the ninth chapter, but I’d like to table that for the time being, and move on to the second half of the season, the truly episodic half. Without spoiling anything, the second arc begins in a very different place than the first, naturally. Unfortunately, this place is veritable mire, one that Bioware and many role-playing game developers often falter in – writing the underdog into a game is just easier, that’s what gameplay and progression mechanics are most often designed to support. Worse though, is the pall of triviality that hangs over it all; chapter ten was not to chapter nine, what chapter one was to the base game. Rather it was a resigned sigh – well I guess we’re here then Outlander, want some fetch quests? No? Come on, I swear they are important. Now I’m not saying every minute of the first half felt vital, but it did feel connected, part of something greater. Nor that the second half’s fetch quests aren’t accompanied by cutscenes and choices, but they did felt inconsequential – each chapter a futile rev of the hyperdrive in the bog metaphoric space mud. No part of it evoked the purity of Stars Wars movies anymore, rather lesser narratives, like that of Homefront 2, sprung to mind. What’s worse, is that the fetch quest didn’t even pay off well. For the most part you’re sent to gather allies essentially, to strengthen your forces in the fight against the Eternal Throne. Yet when the last battle comes where are they? Most of the companion characters stay far out of the way, and the military asserts, the combined forces of several significant powers, are nowhere to be seen, they are not even referenced. The latter chapters introduce additional gameplay here and there, and some episodes are fine as standalone adventures. There are some wrenchingly effective twists, at least partially dependent upon earlier choices, but the grandeur is lost. In fact, were I to compare the first nine chapters to A New Hope, then the subsequent seven would be the Clone Wars animated series – definitely not the cartoon. Let’s take a moment to discuss the Alliance system. Introduced during chapter nine, the system is essentially several strings of side missions, in which you often recruit the numerous scattered companions – all player characters lose their companions at the beginning of this expansion, with all eight classes’ companions eventually becoming available to all characters. This system is built around the ‘Classic’ presentation, meaning that in place of cutscenes and the traditional dialogue wheel, the screen is letter boxed, and none of the dialog is spoken aloud – similar in style to the conversations of Knights of the Old Republic. There is a lot of dialog, I get it, but the thing that sets this game apart from the pack is that dialog, and its implementation here frankly feels cheap. The scale and complexity of the companion missions vary considerably, and are accompanied by the Star Fortress(es). A flashpoint of sorts – its exact contents is somewhat randomised – that can be ran solo, or as a group Heroic. Collecting unlikely companions has proved enjoyable enough, even if the Classic presentation diminishes the delivery somewhat, but the Star Fortresses are a far cry from the large group content many players long for. Were its trajectory a consistent one, KotFE would have doubtless been the grandest and most exciting injection of story content the game has seen since launch. Certainly, the first half of the chapters demonstrated a level of quality and craft, with regards to storytelling and cinematography, far beyond the vast majority of the base game and its earlier expansions. Sadly, the later chapters were unable to maintain that narrative impetus, despite some excellent moments. 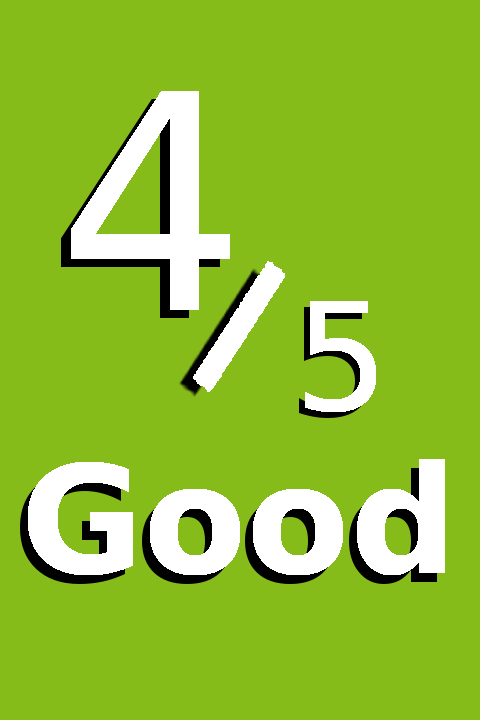 Still it was a promising start to a new and arguably healthier form of content delivery. We can only hope the upcoming sequel, Knights of the Eternal Throne, will address these flaws and deliver the group content so many clamour for.